Dr. Eslick Daniel received honors from the Boys & Girls Clubs of America Tennessee Area Council at its annual membership meeting in Murfreesboro on Sept. 21, 2017. Dr. Daniel was among the six new members who were enshrined into the Tennessee Boys & Girls Clubs Hall of Fame for their lifetime achievements. “The Hall of Fame honors those rare individuals whose high achievements have made a mark in the state of Tennessee. Tennessee has been blessed with many great club kids, volunteers, board member, staff and friends of the Boys & Girls Club movement and the Hall of Fame recognizes the best of the best. These six individuals honored have shaped and inspired local Clubs from across Tennessee and proved to be outstanding in doing so. 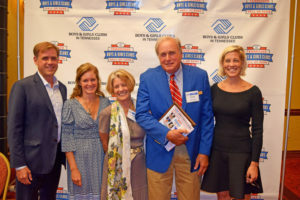 These individuals have achieved the distinction of being true champions for children and have provided innumerable accomplishments and lasting memories,” stated Scott Bullington, chairman for the Tennessee Boys & Girls Club Hall of Fame. 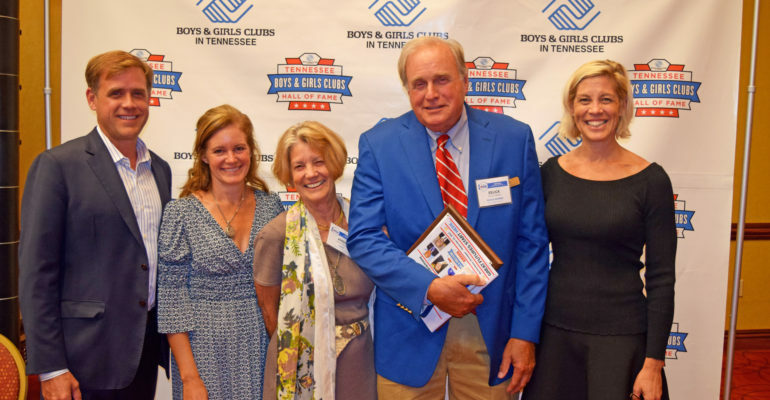 Dr. Eslick Daniel was highly instrumental in the founding of Boys & Girls Clubs of Maury County, and continues to serve on its Board to ensure the success and growth of the organization. As the organization’s longest running Board member, Dr. Daniel has been involved since the organization’s founding in 1999. In addition to serving on the Board since the very beginning, Dr. Daniel is also one of twelve individuals who were key in getting the fledgling Club up and off the ground, and he has since outlasted them all! “He is the one key person who has been there through both good and bad times, and he has basically been the glue of the organization,” said former Executive Director and 2013 TN Hall of Fame Inductee Mr. John Stephens. “Many have said there would not be a Boys & Girls Clubs of Maury County without Dr. Eslick Daniel. He is passionately dedicated to making sure all kids have the opportunity to succeed. We are all tremendously grateful for his contributions to the foundation and continued success of this organization,” said CEO Robyn Peery. Simply put, Dr. Daniel is passionately dedicated to serving “those who need us the most,” and he has devoted significant philanthropic and volunteer efforts since 1999 to ensure there is a Boys & Girls Club in Maury County to achieve this mission. His wife Annie Daniel and their children and grandchildren were present for the dinner celebration in Murfreesboro. Other honors for Maury County included Maury County Public Schools Superintendent Dr. Chris Marczak receiving the New Board Member of the Year award for his contributions and support to local Clubs, and Puckett’s owner Andy Marshall receiving the Tennessee C.A.R.E. (Children Are the Reason for Excellence) Award for his work with several Boys & Girls Clubs. BGC Maury also took home the Program Honor Award for program excellence in academic success. This is the second time that Boys & Girls Clubs of Maury County’s Academic Case Management Program has been recognized as the best academic program in the state (having previously earned the same award in 2014).